Nutrition expert Brad Pilon’s book “Eat Stop Eat” involves fasting, which may be difficult for some people. Especially when it comes to fighting the temptation to sneak in a few small calories as he pointed out in part 6 of this expert interview series. Today the nutrition expert shares with us some interesting facts on milk. So let’s get started. 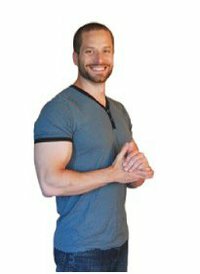 Craig: The fasting day really does allow you to identify those problems and then become a master of your food intake rather than being a slave to the habits and to the sugar and to the forced feeding and all that type of stuff. It truly is a nice independence and freedom from stuff that causes a lot of people problems. Brad: Yes. It’s really weird when you look at food as a relationship, you look at how messed up some people’s relationship with food is. It’s sort of like an abusive partner. People getting used to that, fact that they’re not dependent on that or they can use food on their own terms and eat it when they want to is VERY liberating for a lot of people, I think. Craig: Yes. Some of the most messed up abusive relationships we’ve ever seen are probably in some of the so called healthiest people, the people that are in magazines etcetera that really have a messed up relationship with food. Brad: Oh, absolutely. If you can’t enjoy your food and you define yourself by the food choices you make by making it the number one thing you use to define your worth as a person. Then it’s probably time to reassess your relationship with food. Unfortunately, in the health and fitness industry that’s what a lot of people have been taught. It’s like your value as a human being depends on how strict you can be with your eating. It’s really odd. Craig: It’s just almost religious responses to milk and to bread products and to meat or not-meat. It’s ridiculous. Brad: You can learn that from the beautiful creation of Facebook and just how heated a debate you can get from a profile update that bashes or attacks someone’s food beliefs. Not an attack against a nationality. But if you make a shot against low carb eating or dairy. It’s just going to be an EXPLOSION OF EMOTIONS. Because food is a very emotional thing. The way you define yourself with eating, if you really tied your persona to a belief system wrapped around a way of eating, despite the fact that there’s hundreds of different cultures in the world who all eat differently and if you’re not willing to accept then yes, it really becomes a hard fast belief system that some people will defend it to the death. Craig: That’s interesting stuff. That kind of leads us into the next question here that I want to ask you about. We’ll try and get through things a little bit faster, because we do have a lot of questions here. What is the truth about dairy for fat loss and health? Maybe you want to mention the differences between countries in their dairy as you kind of did an article on how our milk here in Canada is different from the milk in the United States. Brad: Absolutely. I remember once seeing a Facebook update that was actually about milk, and like I said, it was this massive emotional debate of name calling and freaking out on some poor guy’s Facebook page. I think he did the one post and didn’t check it for two days and there was like 120 comments. I thought, “Enough with this.” I’m going to get down to the bottom of this. I looked over the research on milk and obviously there’s just something more that’s going on. So, I started looking into government regulations and dairy industry regulations, all Canadian data. Then, I switched, I looked at American data and some European data. The rules and controls and regulations you have VARY FROM COUNTRY TO COUNTRY, so that’s when you start to realize there isn’t a blanket response because geography makes a difference, even the type of milk makes a difference. Ontario versus Alberta in Canada probably makes a difference in the quality of milk, at least in terms of what is considered acceptable and not acceptable. Then when it comes to weight loss this is where milk gets really interesting. Milk in health there’s a large proponent of things that milk is the deadliest thing in the world and then there’s a fair amount of people who handle it fine. So, kind of leaving health alone for a minute and we’ll talk about that in a second, but in terms of weight loss it gets really convoluted. What people may not realize is there is a large VESTED INTEREST in milk’s effect on weight loss. The first comes from the group who owns the patents on dairy derived calcium for weight loss and the human body. So, there are people who have a vested interest in intellectual property they own for the next 20 years or since whenever they got that patent approved to prove that dairy, and specifically the calcium from dairy, can aide you in weight loss. They’ve invested the tens of thousands of dollars it takes to put a patent application together, put it into the process, defend it when you have to, and finally go through your whole due course. So, we have that group that JUST WANTS CALCIUM TO WORK. Then you have the dairy industry who probably looks at being a weight loss product is not a bad idea. Those guys make a lot of money, we could tie in a weight loss thing to our product and we’d be rocking. So, they’re not exactly opposed to the idea of milk being a weight loss ingredient. So, does the data bear out? Does drinking four of five glasses of milk cause you to drop all your fat and be shredded and beach ready? The answer is probably not. The reason I’ll give that answer is because I have yet to find a food, even if it did have mysterious fat burning properties, its effect on fat burning would NEVER outweigh its core concept. So, if a glass of milk has 100 calories in it I don’t think there’s any evidence anywhere to suggest that one glass of milk can cause you to somehow burn an excess above and beyond what you’d normally burn of 100 calories. It just comes common sense. In terms of weight loss I don’t see a large benefit. In terms of health, and the interesting thing about health for everything is that people love to talk about it and no one likes to measure it. If you’ve had blood work done and you know all your measurements are excellent and you drink milk on a regular basis, then you cut out milk and you have blood work and your NUMBERS ARE THE SAME and you enjoy milk, there doesn’t seem to be a reason to cut it out. So, for most people they can fit into there lifestyle unless there is an intolerance or allergy or something else, but in general it can fit in. Again, most likely just like everything else the dose would be in the poison. Interesting stuff! Lets look at part 8 where Brad Pilon discussions food and metabolism.